I’ve combined all my blog-posts into a single site, the musings here range from knitting moebius scarves to the NHS, with a side salad of business process modelling. All my public posts are now here in one place, including the ones from Facebook. I am a skeptic and a blogger but I blog about too many things to count as a Skeptical Blogger though I may discuss skeptical matters more now that I’ve got a single place to post things. Blogging takes me longer now than it used to; my standards are higher and I know more about writing so I no longer blog-as-therapy. In fact I find it less enjoyable now, than I did back in 2006 when I started. So no promises on frequency, but good intentions on quality and a resigned acceptance that I’ll tackle any topic which interests me, the shinier the better. 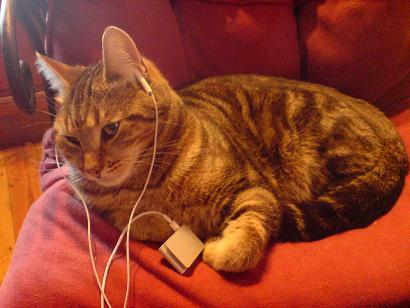 In the meantime, since this is the internet, here is a cat listening to pawdcasts. It’s been almost three years since I blogged here. I stopped because I wanted to blog in my own name and I didn’t have enough mojo to maintain two blogs. I am starting again because I want to post pseudonymously again. Also, I liked Aphra and I miss her. My life has changed quite a bit during these three years; I live elsewhere and I work for someone else for a start. Unfortunately I have also become a lot fussier about what I write, which means it takes me more time to produce less. But my interests are still eclectic. And I still fizz with anger, rage and shock. And, guess what, the NHS is in crisis again, and the USA is madder and scarier than ever. Oh, and I still notice the banal and the ridiculous and pick it up and say “look… shiny….”. Ruthless blog-promotion – how long does it take? It’s a fair cop. I’ll hold my hand up to it: in these days of cyber-vetting I wanted anyone who googles me to find my professional persona. The quickest way to make sure of that seemed to be to write a blog, but the days of “build it and they will come” are gone so you’ve got to put in some effort. “Quick” is a relative term of course, and this is the first time I’ve actively promoted a blog rather than allowed it to grow organically, and that has been time consuming bit. If you are about to do this yourself, you might like to know how long it takes. You’ve got to have a blog to promote! If your content is poor, the blog will fail. Unfortunately it needs more than good content to succeed. Links: put links in your posts. Your blog is more useful and therefore more attractive; your stats will be more informative and that tells you what your hot topics are. Some of the people you link to will call by to see who is linking to them. Your blog becomes a conversation rather than just a speech, and that helps the blog build up a reputation. Tags and Categories: use them to label your blog. Categories help people find their way round your blog, tags are useful for infrequent topics. They both help people find similar blogs, and they help search engines find you. Networking: put the word out among friends and colleagues and in the online places where you already hang out. I’ve got links from my profiles in Facebook and Linked-In, I emailed some pals, I posted the site’s address in a few of the forums where I’m a regular and I added the link to my email signature. Not surprisingly, the first few comments were from folk who know me. They know who they are, and the drinks are on me. Building a reputation: is a matter of getting out there and joining in. No, not hustling. Not spam. Not “Cool site. I link to you.” Reading is more interesting than writing anyway, but I sometimes find it’s easy to let it fall by the wayside, so this is a discipline that has become a pleasure. I use Google Reader to gather together the new posts in blogs I read regularly. Blog Directories: this is the arduous work of submitting your blog to blog directories, but it’s worth it. A quick google produces a long list of directories, and then you just register with them and add a reciprocal link to your site. I say “just”: this is time consuming but mindless. The directories I’ve submitted this blog to are in the column on the right, but don’t take my word for it: google for the latest advice. (Update: Robert A Kearse has commented on this post and provided a link to the list of 300 or so active blog directories on his site – an extremely useful resource). Beauty contests: is the term I’ve used for sites like Delicous, Stumble Upon and Digg where readers vote on their likes and dislikes. I’m not convinced by the wisdom of crowds so I find this soul-destroying. I’m not an active users of any of the sites and, stupidly, I’m not convinced that the people I want to read my blog will use them either. Which brings me to the question of who is my reader? I fondly imagine that you are some other IT-like person and we are in a pub after work shooting the breeze. But who knows? I’m a little afraid to ask. I’d love it if you came back again and again, subscribed to my feed, hung on my every keystroke, trembled when I posted, quivered as you read. In fact you were chasing a search term and will probably never come by again. So – how much time did this ruthless self-promotion take me? Creating content – up to an hour a post: the first draft is always longer. Adding links, tags and categories is a matter of minutes or moments. Look and feel – a couple of evenings messing about with WordPress Themes and widgets: this is so soothing that I still tinker with it every now and again. Networking – hardly any time at all: I mentioned it in passing and left it at that. Reading and commenting – I set myself a target of between one and two hours every evening for two weeks and then a couple of hours once or twice a week thereafter. First of all you have to find the blogs, which is where all those blog directories finally prove their worth, but then it’s just a matter of subscribing. Reading and commenting is the fun bit though, where the web turns into a dialogue. Blog directories and beauty contest sites – several evenings and a couple of weekends: dull but easy to multitask (I cooked food, watched tv, gossiped on MSN, listened to podcasts, stroked the cat and drank tea while I did it). What’s “worth it”? At the quantitative end of the scale, I can tell you how many visitors I get but with a blog like this it’s not just numbers. If I wanted numbers I’d put up pics of public people’s private parts, or cute pictures of cats with illiterate captions, such is the wisdom of crowds. I’m pleased that the blog is sparking conversations, and I enjoy the conversations it’s sparked. I guess the acid test would be unsolicited job offers. But now I’ve mentioned it, they wouldn’t be unsolicited. Sketch of the Day – a treat and a treasure – grown-up sketches by a grown-up person described with wit and posted every day. Le Pen Quotidien – another daily drawing blog, less assured and established, but still worth clicking through. Things I’m Grateful For – an unconsciously thought-provoking private blog which could almost be an exercise in narrative style; it makes no concessions for the reader, neither bothering to explain context nor trying to engage your emotions. Oddly compelling, though I should warn you that it includes animated smileys. Can I sit with you – a collection of fictional or fictionalised pieces by different authors about the general awfulness of school; the bloggers intend publishing the best via Lulu. A productive use the blogosphere. From this you’ll see I’m not very interested in diaries, pregnancy, lactation, the extreme cuteness of the writer’s blogspawn, their relationship with their darling husband, recipes, church-bases socialising, or their dating and social lives. Those blogs give pleasure to their authors and do me no harm, but I don’t drop by twice. Shelves in my mind – the sort of blog I’d like to write; short considered pieces which examine everyday life with thought and humour. The writer is an American mother in the UK who writes thoughtfully and unsentimentally about her life. Dairy Daze – More interesting for the quirk of the situation (a city girl who’s now a dairy farmer) than for anything else. Engaging though, particularly if you are interested in rural life in the 21st century, which I am. While clicking through the NaBloPoMo randomizer I found a blogger who posts one photo relating to her family every day. As photos they were pretty mundane; the first page alone showed three different dinners cooking in pans on the top of the stove. But the idea is interesting. On searching, I’ve discovered that there is in fact a whole Project 365 dedicated to the idea of 365 self-portraits. I lack the stamina and the vanity for that. However, I rather fancy the discipline of finding one thing worth looking at every day, and then finding a way of showing it which is worth sharing. I’m not going to do that this month, obviously, but I might do a personal BloPhoMo for a month next year. Likewise, elsewhere on the internet I found a blog consisting of 365 43-word pen-portraits. That also appealed to me mightily. So I am thinking of doing more themed stuff here next year. We’ve had informal themes, particularly the MMC and MTAS shite-fest, the brain-dump about questions, and of course Fantasy CEO. I like the idea of moving that on from an indulgence to a discipline. In fact, this blog could do with some discipline altogether. Quite apart from anything else, the words “I” and “me” turn up here too often, so maybe a month of posting without them would do me good. I’d like to get rid of some of my other linguistic quirks: I’m altogether too fond of complex verb formations as you can see clearly in the first paragraph of this particular post, and when I come back to my posts I often find them breathless and – well – colloquial. And there’s another one – that use of “well” to mimic hesitant speech. Maybe I’ll take a month and focus more on form than content and expunge those mannerisms. Oh, and a month off would be nice. In fact, I suspect a month off would be essential. I could take a zen-like approach to blogging by not blogging. A NoBloPoMo in fact. So NaBloPoMo and Project 365 may spawn all sorts of oddities here next year. I will however spare you a month of haiku. That’s guaranteed. I said I wouldn’t do another meme but I have been thinking about the whys and wherefores of this blog for the last few weeks and worrying about NaBloPoMo slightly, so this is particularly a propos. I picked it up from Charlotte, who gracefully credits yogamum. 1. Do you promote your blog? 2. How often do you check hits? Two or three times a week, maybe weekly. When I remember. It varies. 3. Do you stick to one topic? Absolutely not. The blog is where I blart out whatever is on my mind at the time, be it a haiku about birds, photos of places I’ve been, rants about the government, or attempts to understand my own reactions to something I’ve read. You have a butterfly mind. 4. Who knows that you have a blog? Well you do, obviously. Most of the friends I’ve made online, many of whom are real life friends now. Colleagues and family don’t. 5. How many blogs do you read? Not enough, which is bad blog karma. I do read the ones in my blogroll, but intermittently. I keep links to some closed blogs for sentiment’s sake. 6. Are you a fast reader? It’s a Sunday game; I couldn’t read for my County. 7. Do you customise your blog or do anything technical? 8. Do you blog anonymously? I blog pseudonymously, which is different. Aphra Behn is a pseudonym I use more or less consistently across the internet at the moment. 9. To what extent do you censor yourself? I don’t talk much about my emotional life, my relationship, living family members, my employers, books, my studies or my finances. I do talk about my sexuality, my medical situation, my politics (such as they are) and to some extent about my job. Basically you have a certain amount of access to the inner Aphra but less access to the outer Ms Behn. 10. The best thing about blogging? Feedback. In the words of Chrissie Hynde: I want some of your attention. This seems to be a self-tagging MeMe, so feel free to post about YouYou. If you link to me, I will certainly read it.